Spend an unforgettable day discovering two charming cities in Normandy. Accompanied by a driver-guide passionate about the region, you will cross the French countryside in a pleasant atmosphere in a small group, carried in a comfortable minibus. Rouen will open the doors of its impressionist setting through a walking guided city tour and a free visit of the Musée des Beaux Arts. You will discover the gorgeous harbor village of Honfleur with its picturesque streets and houses. The trip will end with the discovery of the norman cider making process followed by a nice tasting and a nice tasting. You will leave at 6.45 am from our Louvre agency aboard a comfortable and air-conditioned minivan to explore Normandy driving through typical landscapes and the green countryside. After a two-hour journey, you will start your tour with a walking guided tour of the city of Rouen of Rouen city that inspired the greatest impressionist painters. You will walk on the downtown pedestrian streets while listening to the comments of your guide. Among the landmarks you will see, you will pass under the famous Gros Horloge perched on an Arch in the heart of the city. You will also visit the famous Rouen’s Notre Dame Cathedral that was painted many times by the master of Impressionism, Claude Monet. You will then enter in the Musée des Beaux Arts in Rouen where you will have an hour to discover on your own the great works of the second largest Impressionist collection in France. Among the most beautiful works of art, you can admire Claude Monet’s “Champ de coquelicots, environs de Giverny” (Poppy field, near Giverny), « Le Pont Boieldieu à Rouen, soleil couchant, temps brumeux » (Le Pont Boieldieu in Rouen, setting sun, foggy weather) of Pissaro, « Chemin montant au soleil » (path going up in the sun) painted by Alfred Sisley or “Chrysanthemum Bouquet” (Bouquet de Chrysanthèmes) of Pierre-Auguste Renoir. 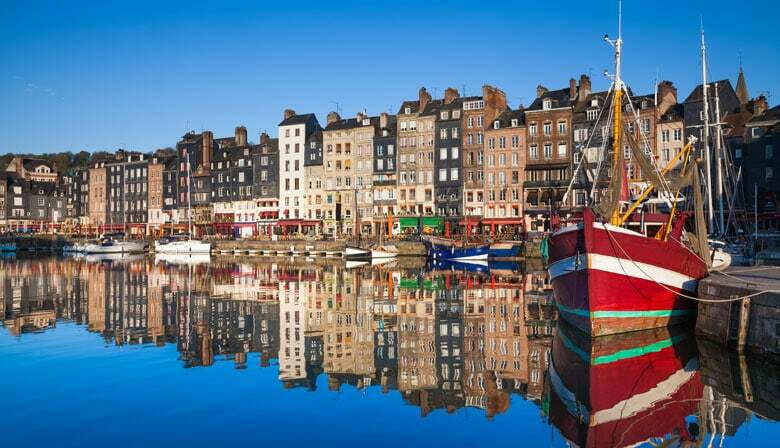 You will continue your journey on the impressionism theme with the second stopover in the quaint port city of Honfleur. You will have lunch in the traditional restaurant « Au vieux Honfleur » located on the harbor where you will taste culinary specialties of the city. Our driver-guide will then take you through the cobbled streets with charming half-timbered houses. You will be delighted by this guided tour during which you can discover all the charm of the city with its colors and lights changing according to the seasons. You will also see the old trawlers docked on the authentic port of Honfleur. You will then stop at the Apreval cider farm for a guided visit where a guided visit will be offered. The guide will explain the cider and the Calvados making process. This charming estate fully reflects the typical Norman setting surrounded by many apple trees. These fruit trees were Monet’s source of inspiration and are represented in many of his paints. You will end your day with a pleasant tasting in this cider house. The departure is scheduled at 4 pm for an arrival at our Louvre agency around 6.45 pm. You will receive the booking confirmation of your tour by email, as well as a voucher. Please present it to the PARISCityVISION Agency (printed or on your smartphone) prior to the tour departure.